It may sound like a no-brainer, but before you go on a job interview, you need to know who you'll be meeting with. It could be one person, or it could be quite a few people. Given the limited resources for hiring new staff and the costs associated with bringing in new employees, employers are extra careful when it comes to hiring. This has translated into adding more layers to the screening process, including the inclusion of more staff in the interview process. Applicants should make an effort to learn who will be included in the interview process so they can anticipate the concerns of those interviewing them and prepare accordingly. The first thing to do is to ask Human Resources (HR) for the names, titles, and roles of any interviewers when making arrangements for your interview. Employers will often have an HR recruiter conduct an initial interview to determine if a candidate is genuinely interested in the position and a good fit for the company. This makes sense because if you're not a good fit, they don't want to waste the time of their employees. These screening interviews are often conducted by phone or Skype. Calling or emailing to confirm the interview gives you another opportunity to ask if you weren't informed when the interview was scheduled. You can also ask for an overview of the hiring process, so you get a sense of how many interviews the employer likes to conduct before making an offer and the rule of thumb with regards to what staff members generally attend interviews. For senior management positions, the employer may engage a recruiting firm to conduct an initial screening and recommend candidates. Typically, the prospective supervisor and department manager will be in attendance for a follow-up interview. At these meetings, employers will often include employees who hold the same job, or a similar job, to the one for which you are interviewing. Though it might seem like their primary purpose is to educate you about the details of the position, the staffers in attendance will be asked to evaluate you as well. It comes down to whether or not you fit the corporate culture and get along with the team. Representatives from departments that interface with, or are served by, your prospective department might also be a part of the interviewing team. Occasionally, an outside entity, such as an affiliated firm, might be represented. For example, an Alumni Affairs department at a college might ask an alumni leader to interview candidates for a position in that area. It's worth noting that some organizations will have a final layer in the process whereby the leading candidate(s) meet with the President, CEO, or another top executive for a final look before finalizing the hire. Whoever you meet with, it's important to send a thank you letter to everyone who interviews you. 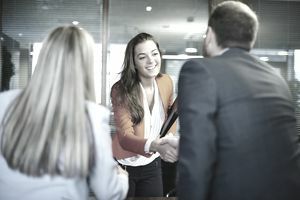 It can be time-consuming when the interview process is multi-layered, but acknowledging someones time and effort to meet with you is one of the best ways to make a good impression.